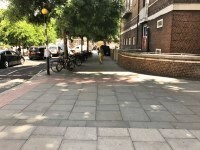 The following information describes the route from the Main Quad to Langton Close via Gower Street, Torrington Place, Byng Place, Gordon Square, Tavistock Place, Regent Square, Sidmouth Street, Gray's Inn Road, Wren Street and Langton Close. 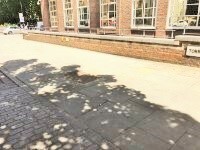 The approximate distance of this route is 1.9 kilometres. 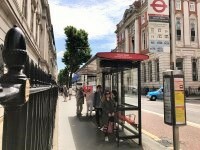 The route takes approximately 23 minutes. 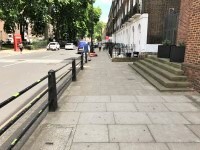 The potential hazards on this route include; busy roads, crossing points (Torrington Place, Malet Place, Woburn Square, Bedford Way, Woburn Place, Marchmont Street, Hunter Street, Wakefield Street, Grays Inn Road) and congested pathways. 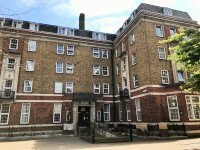 For further information regarding the Langton Close Building please click here. 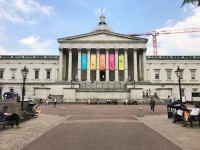 You are on Main Quad to Torrington Place Crossing. Skip to the next section. 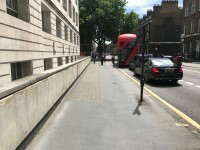 The path becomes narrow in places most notably when passing the two bus stops positioned along this section of the route (photographs 3 and 7). 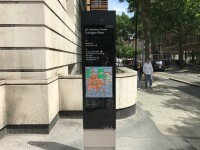 There is a university map column located at the turning (photograph 10). 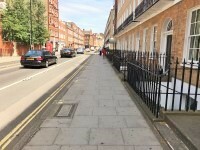 Upon reaching the end of the path, continue ahead and cross over Torrington Place. 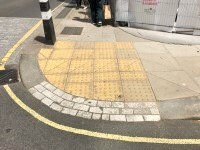 There is tactile paving leading up to the crossing (photograph 11). 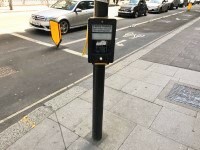 You are on Torrington Place Crossing. Skip to the next section. The road is mostly even with uneven areas. 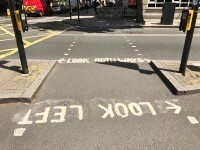 Traffic flow is from the right hand side for vehicles and the left hand side for cyclists. 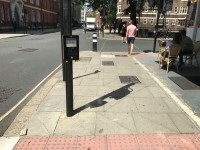 You are on Torrington Place Crossing to Malet Street Crossing. Skip to the next section. 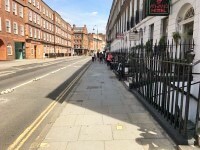 Having Crossed over Torrington Place, turn left and continue ahead along Torrington Place for approximately 55 metres towards the Malet Street Crossing. 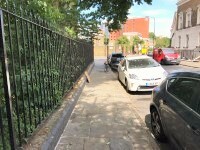 The path also has an easy gradient downhill slope along its entirety. 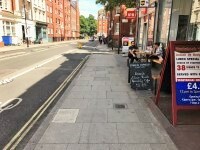 The path is mostly even with the exception of raised paving slabs in places along the left hand side. 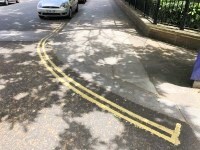 This is caused by tree roots. 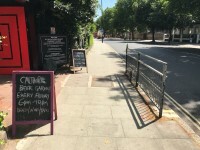 The path narrows in places due to obstructions such as shop signage (photograph 2). 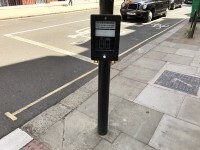 You are on Malet Street Crossing. Skip to the next section. 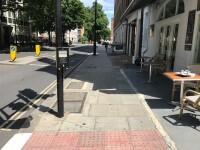 Upon reaching the end of the path, cross the road over Malet Place. 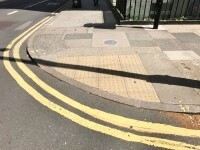 The road surface has a slight uphill easy gradient along its entirety. 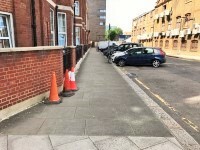 The road surface consists of tarmac and is mostly even. 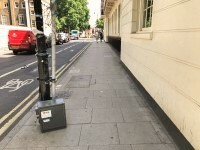 You are on Malet Street Crossing to Byng Place. Skip to the next section. 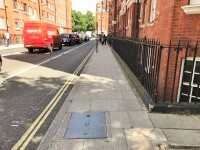 Having crossed over Malet Street, continue ahead along Torrington Place for approximately 50 metres towards Byng Place. 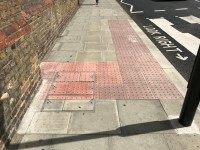 There is tactile paving across the path (photograph 2) approximately 7 metres beyond the crossing. There is an easy downhill slope along the entirety of the path. 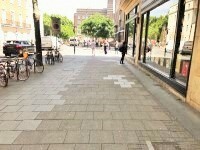 The path is mostly even with uneven areas. 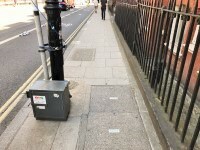 The path narrows towards the end due to a clothing bank and bins located on the right hand side of the path (photograph 3). 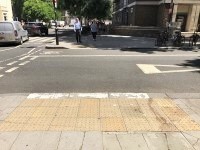 After approximately 40 metres, there is a vehicle access road crossing. 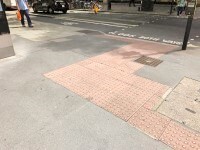 The crossing has no tactile paving. 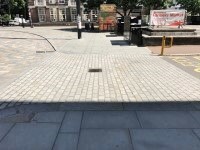 The road surface consists of brick paving and dips in the centre due to a drain. 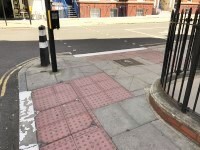 When crossing, be wary of vehicles entering/exiting the road. 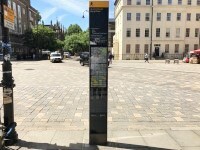 You are on Byng Place to Woburn Square Crossings. Skip to the next section. 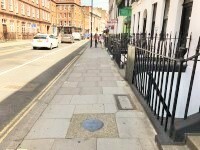 Having crossed, continue ahead along Byng Place for approximately 100 metres towards the Woburn Square crossings. 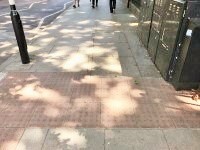 The path is mostly level with slight easy gradients in places. 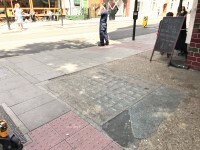 The path is mostly even with uneven areas caused by lowered/raised drain hole covers and paving slabs. 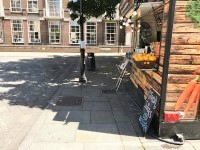 After approximately 15 metres, there is an on street food and drink vendor located on the right hand side of the path and a lamp post on the left hand side of the path (photograph 2). 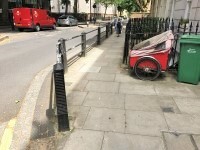 This causes the path to narrow to 120cm (photograph 3). 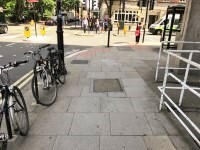 Having passed between the lamppost and the vendor, continue ahead for approximately 4 metres until reaching the Torrington Square vehicle access road crossing (photograph 4). 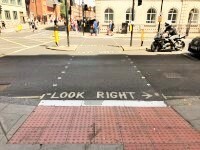 Having crossed, turn left and continue ahead for approximately 25 metres. 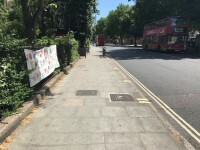 Upon reaching the end of the path, turn right and continue ahead along Gordon Square for the remaining 45 metres until reaching the Woburn Square crossings. 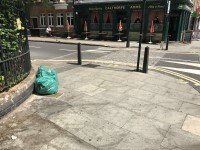 You are on Woburn Square Crossings. Skip to the next section. 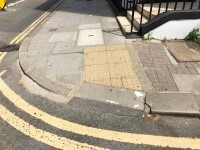 The road surface has a slight camber and is mostly even. 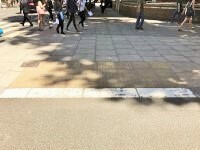 When crossing, be wary of vehicles entering/exiting Woburn Square. 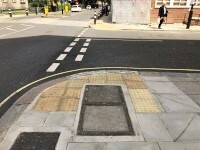 Approximately 15 metres after crossing over Woburn Square, there is a similar crossing also called Woburn Square (photographs 5 and 6). 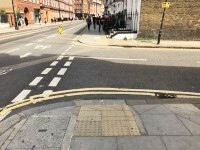 This crossing has easy gradients between the path and the road on both sides. 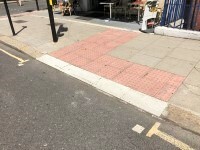 The path between the two crossings consists of block paving and has a slight camber. 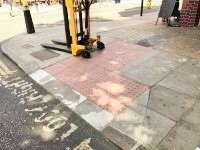 There is tactile paving across the path immediately beyond the first crossing (photograph 3). 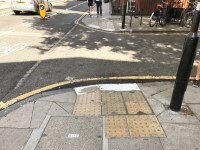 The path is mostly even with uneven areas due to lowered/raised drain covers. 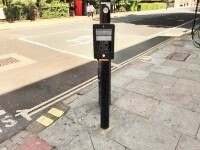 You are on Woburn Square Crossings to Bedford Way Crossing. Skip to the next section. 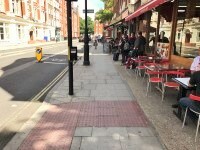 Having traversed both Woburn Square crossings, continue ahead along Gordon Square for approximately 70 metres towards the Bedford Way crossing. 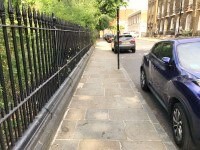 The path has a slight easy gradient sloping towards the road along its entirety. 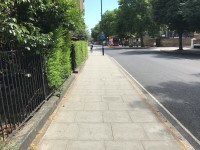 The path also has an easy uphill slope along its entirety. 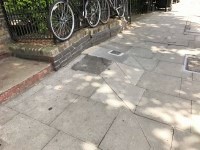 The path is mostly even with uneven areas due to lowered/raised drain hole covers (photographs 2, 3 and 4). 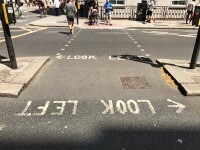 You are on Bedford Way Crossing. Skip to the next section. 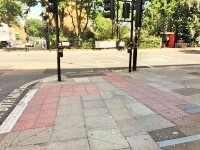 Upon reaching the end of the path, cross the road over Bedford Way. 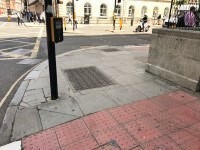 The crossing consists of 2 sections separated by a central island. 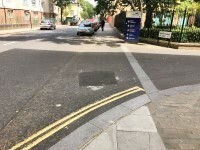 The central island is level with the road. 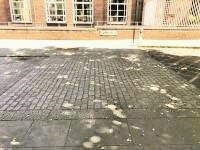 The road surface is mostly even. 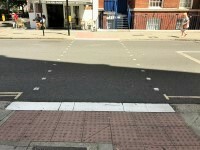 Traffic flows from the right at the first part of the crossing. 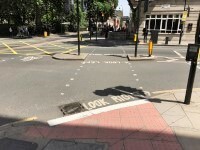 Traffic flows from both ways at the second part of the crossing. 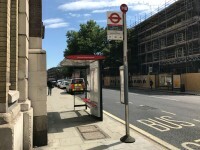 You are on Bedford Way Crossing to Woburn Place Crossing. Skip to the next section. 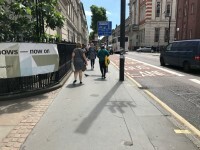 Having crossed over Bedford Way, turn slightly left and continue ahead along Tavistock Square for approximately 70 metres towards the Woburn Place crossing. 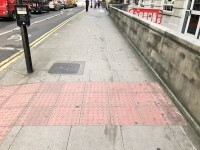 There is tactile paving across the path approximately 8 metres beyond the Bedford Way crossing and 8 metres prior to the Woburn Place crossing (photographs 2 and 4). 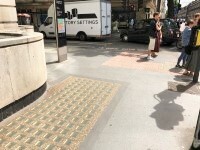 You are on Woburn Place Crossing. Skip to the next section. 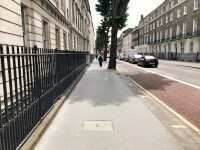 Upon reaching the end of the path, cross the road over Woburn Place. 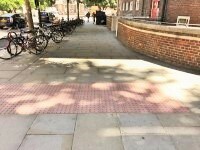 There are easy gradients between the path and the road. 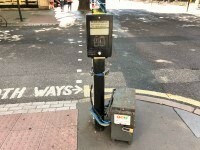 The visual signals are activated via push buttons, these are between the heights of 95cm and 105cm. 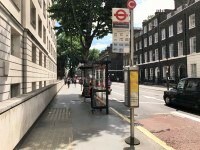 You are on Woburn Place Crossing to Marchmont Street Crossing. Skip to the next section. 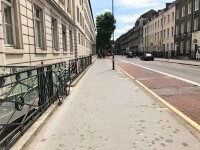 Having crossed over Woburn Place, turn slightly left and continue ahead along Tavistock Place for approximately 180 metres towards the Marchmont Street crossing. 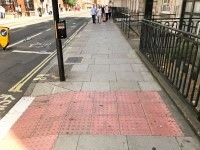 There is tactile paving across the path, approximately 10 metres beyond the Woburn Place crossing. 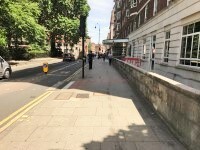 Approximately 25 metres beyond the Woburn Place crossing there is a section of lowered path due to there being vehicle access point to the right hand side (photograph 3). 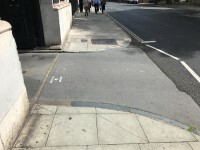 Be wary of vehicles entering/exiting when traversing this section of the route. 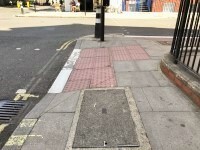 Approximately 65 metres beyond the vehicle access point cross the road over Herbrand Street. 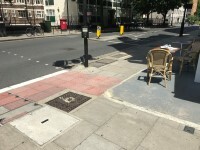 The crossing (photographs 5 and 6) has tactile paving and dropped kerbs on both sides. 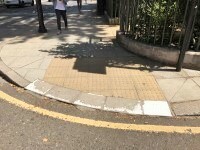 The section of dropped kerb on the far side of the crossing is narrow. 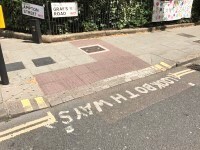 Having crossed over Herbrand Street, continue ahead for the remaining 90 metres towards the Marchmont Street crossing. 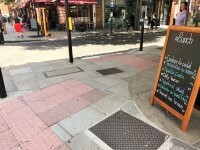 You are on Marchmont Street Crossing. Skip to the next section. 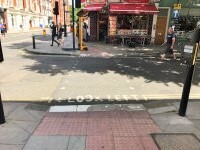 You are on Marchmont Street Crossing to Hunter Street Crossing. Skip to the next section. 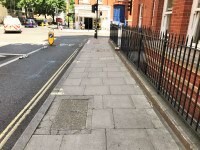 Having crossed the road over Marchmont Street, turn slightly left and continue ahead along Tavistock Place for approximately 125 metres towards Hunter Street. 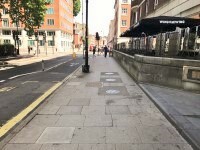 The path along this section of the route consists of block paving with concrete and glass slabs immediately beyond the crossing (photograph 1). 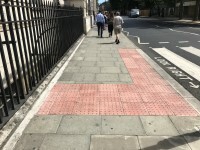 There is tactile paving across the path, approximately 7 metres beyond the crossing (photograph 2). 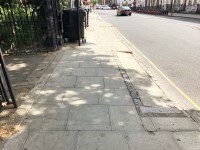 The path is downhill and has a slight easy gradient sloping towards the road along its entirety. 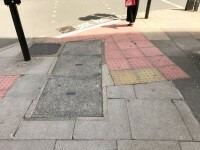 The path is mostly even, with uneven areas due to lowered/raised drain covers. 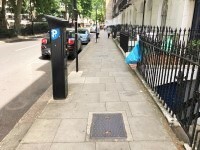 The path narrows in places due to lampposts and signage. 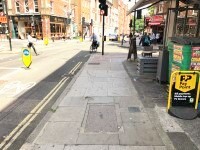 Approximately 40 metres beyond the Marchmont Street crossing, cross the road over Kenton Street. 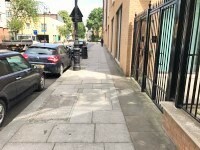 The road is level and even with a tarmac surface. 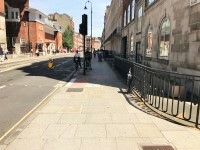 Having crossed over Kenton Street, continue ahead along Tavistock Place for the remaining 80 metres until reaching the Hunter Street crossing. 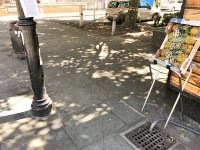 You are on Hunter Street Crossing. Skip to the next section. 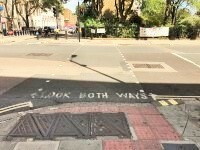 Traffic flow is from both the right and left. 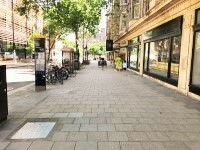 You are on Hunter Street Crossing to Wakefield Street Crossing. Skip to the next section. 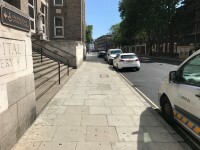 Having crossed the road over Hunter Street, turn left and continue ahead along Hunter Street for approximately 7 metres towards Tavistock Place. 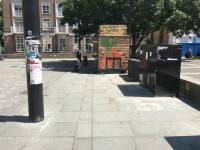 Upon reaching the end of the path, turn right and continue ahead along Tavistock Place for approximately 60 metres towards the Wakefield Street crossing. 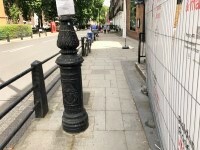 The path narrows in places due to lampposts (photograph 3). 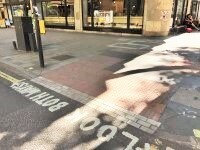 You are on Wakefield Street Crossing. Skip to the next section. 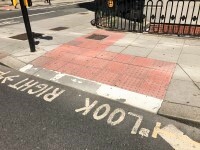 Upon reaching the end of the path, cross the road over Wakefield Street. 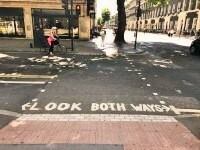 Traffic flow is from both the left and right. 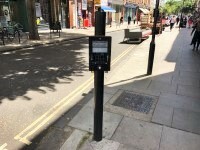 You are on Wakefield Street Crossing to Gray's Inn Road Crossing. Skip to the next section. 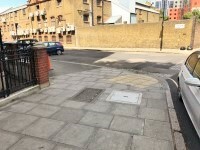 Having crossed the road over Wakefield Street, continue ahead for approximately 300 metres towards the Greys Inn Road crossing. 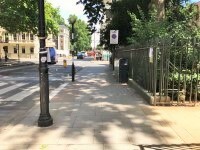 After approximately 50 metres, Tavistock Place becomes Regent Square. 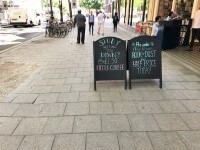 After a further 90 metres (approximately), Regent Square becomes Sidmouth Street. 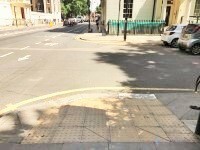 Continue ahead along Sidmouth Street for the remaining 160 metres towards the Greys Inn Road crossing. 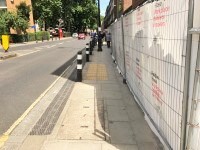 The path narrows immediately after the crossing due to temporary construction fencing on the right hand side (photographs 1 and 2). 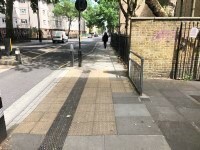 There is tactile paving across the path in a number of places (photographs 3, 7 and 12). 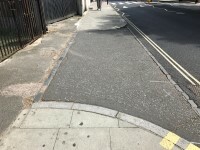 The path is mostly even, with uneven areas due to lowered/raised drain covers and paving slabs. 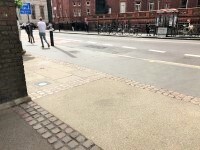 Approximately 70 metres along Sidmouth Street, there is a vehicle access crossing over Westking Place (photographs 9 and 10). 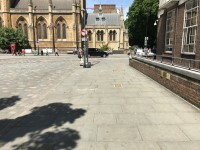 The road surface is level with a tarmac surface. 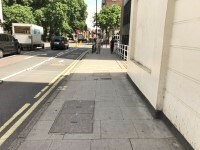 Having Crossed, continue ahead along Sidmouth Street for the remaining 80 metres towards the Greys Inn Road crossing. 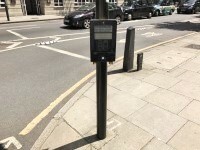 You are on Gray's Inn Road Crossing. Skip to the next section. 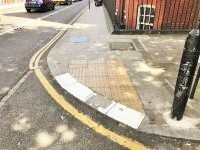 The tactile paving at the approach to the crossing is minimal due to drain covers on the path (photograph 1). 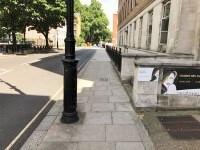 You are on Gray's Inn Road Crossing to Wren Street. Skip to the next section. 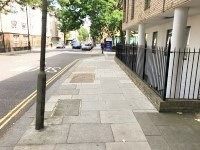 Having crossed the road over Gray's Inn Road, turn right and continue along Gray's Inn Road for approximately 300 metres towards Wren Street. 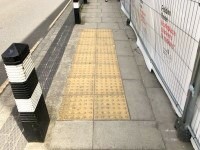 There is tactile paving across the path in places (photographs 5 and 10). 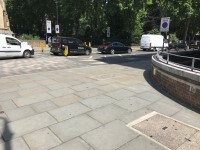 Approximately 60 metres beyond the Gray's Inn Road crossing, there is a vehicle access road crossing (photograph 4). 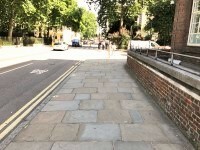 There are slight easy gradients between the path and the road on both sides. 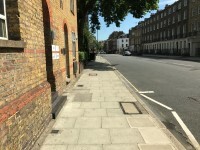 The road over the crossing slopes slightly from left to right towards Gray's Inn Road. 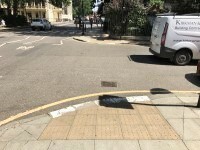 Approximately 30 metres after crossing over the vehicle access road, there is a second similar vehicle access road crossing (photograph 6). 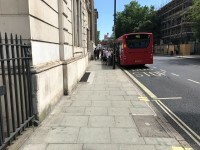 Having crossed the second vehicle access road, continue ahead past the bus stop (photograph 8) along Gray's Inn Road for 160 metres towards St Andrews Gardens. 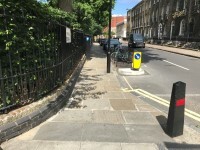 There is a raised section to the left of the path (photograph 12), as well as a lowered kerb to the right of the path (photograph 13) close to the St Andrews Gardens entrance. 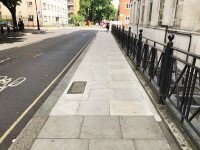 Having traversed this section of the path, continue ahead along Gray's Inn Road for the remaining 20 metres towards Wren Street. 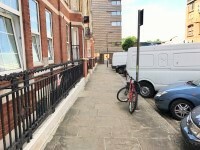 You are on Wren Street to Langton Close. Skip to the next section. 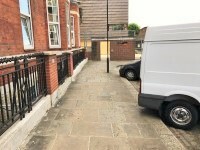 Upon reaching the end of the path, turn left and continue ahead along Wren Street for approximately 100 metres towards Langton Close. The path has an easy downhill gradient along its entirety. 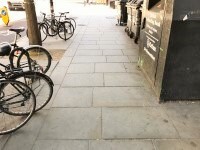 The path narrows in places due to a payment machine as well as lampposts (photograph 1). Upon reaching the end of the path, turn left onto Langton Close. 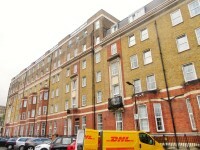 You are on Langton Close to Langton Close Building. Skip to the next section. 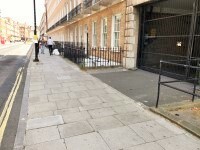 Continue along Langton Close for approximately 50 metres until reaching the main entrance to the Langton Close Building. 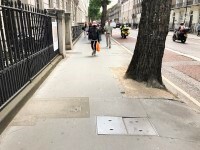 The path along this section of the route is level and mostly even. 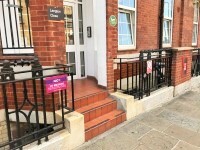 The security gate is located a further 15 metres along Langton Close, to the right as you face the main entrance. 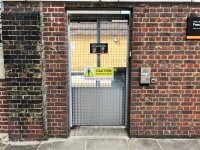 For further information regarding access into the Langton Close Building please see the relevant access guide.